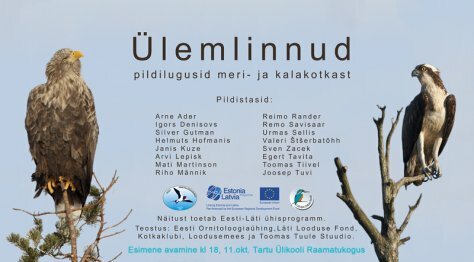 The Estonian Ornithological Society and the Latvian Fund for Nature cooperate in supporting the project "Eagles cross borders“. Within the project a photo exhibition about ospreys and white-tailed eagles has been prepared where authors from Estonia and Latvia present their (photo) stories of eagles. The exhibition will travel simultaneously in Estonia and Latvia during two project years. The first opening of the exhibition in Estonia will be at 18.00, on October 11, 2011, in the foyer of the third-floor reading room of the University of Tartu Library. Anyone who cannot be at the first opening can come to one of the coming ones ... Information about new exhibition locations will be sent out in good time.